2017 will mark the second time that the Azzurri have qualified for the Rugby League World Cup. Great strides were made in their first appearance in the World Cup in 2013, and hopes are high that they can at least reach the Quarter finals this time around. In 2013, Italy were drawn in Pool C alongside Scotland, Tonga and co-hosts Wales. Their tournament began with an upset victory over Wales at Cardiff's Millennium Stadium. In their second match, they took on Scotland. The match turned out to be a thriller and it was tight with the game ending in a high scoring draw. All Italy had to do then was win their last group match against Tonga after Scotland won their match and finished with the same points. Tonga had nothing but pride to play for after their hopes of qualification had vanished but they shocked the Azzurri by keeping them scoreless and eliminating Italy from the World Cup. Wounds were licked and Italy dusted themselves down to begin qualification for the 2017 Rugby League World Cup. The first stage of qualifying involved having to finish in the top 3 in their 2014–15 European Shield competition. Italy only managed to secure qualification for the 'final qualification tournament' after winning their second to last game against bottom placed Ukraine. Italy finished the Shield in third place with 3 wins and 3 defeats in six matches. Now ranked 14th in the world and heading into the 2017 Rugby League World Cup, a strong squad has been selected, below are a few names who will be an integral part of the Italian squad. Terry Campese: Former Canberra Raiders and Hull KR half, Terry Campese, played a pivotal role in the Azzurri qualifying for the 2017 Rugby League World Cup after impressive performances against Serbia and Russia. Returning to Australia in 2017, Campese is almost certain to feature and will provide some much needed direction around the halves. James Tedesco: Tedesco was only 20 when he made his international debut in the 2013 Rugby League World Cup, and whilst in that tournament he was pushed into the centres by captain Anthony Minichiello, Tedesco is almost guaranteed to be starting fullback for the Italians in the 2017 event. Paul Vaughan: The former Canberra Raiders forward will bring some much welcomed grunt to the Italian forward pack, with the prop forward certain to build on his impressive performances for the Italians in 2013. Joel Riethmuller: Seven Test veteran, Joel Riethmuller will not only bring a wealth of experience to the Italians at World Cup 2017, but the former North Queensland Cowboy and current Northern Pride player will bring some much welcomed knowledge and experience to the squad. Mark Minichiello: The younger brother of Anthony, and Italy captain. Mark has had a hugely successful career and, for the past couple of seasons, has plied his trade in the English Super League with Hull FC. 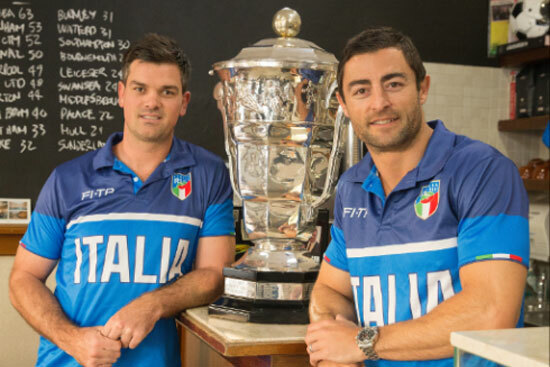 Former player, and member of the 2013 squad, Cameron Ciraldo is the coach of Italy and is assisted by ex Australia and Azzurri full back Anthony Minichiello. Minichiello was also involved in the last World Cup as a player and his experience in the game is invaluable. Minichiello said the opportunity to represent the country from where his father had emigrated to Australia at the age of 13 in a Rugby League World Cup was among the highlights of his illustrious career. “It was a really proud moment. The joy of my family to represent their heritage and play with my brother again was something I will never forget,” he said. Ciraldo’s grandmother was born in Calabria and his grandfather came from Sicily. “They came out here for an opportunity and worked their arses off to create a better life for their family, so when I think about the sacrifices they made I get pretty emotional and I am just really proud to represent them,” he said. Despite a long history in international Rugby League, Italy will face three relatively unknown opponents when they make their way to Australia for the 2017 Rugby League World Cup. Fiji, Ireland and USA are in their group this year and only the USA Hawks have played Italy before. The last encounter between the two nations being at the 2000 Emerging Nations World Cup in England. On that day, Italy ran out 40 – 16 victors over the USA team at The Shay in Halifax. With each of their opponents set to boast plenty of NRL and Super League experience, the Italians will have a difficult task ahead of them if they are to progress from the World Cup group stages for the first time.